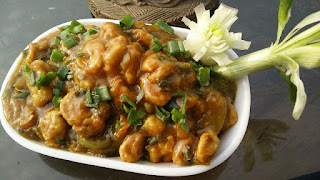 A healthy and delicious dry manchurian dish made with nutritious soya chunks. 1. In boiled soya chunks, add gram flour and 2 tsp oil and mix well to coat the soya chunks. Airfry these chunks at 180 degrees for 8 min. 2. For the gravy, heat 1 tsp oil in a pan. Sauté ginger garlic, spring onions, sliced capsicum. Add mixture of corn flour and water and cook it for 15 min. Add salt, black pepper powder, chilly sauce and soya sauce. Cook for 5-10 min more at medium flame, till the gravy thickens. 3. Add the air fried soya chunks in the prepared gravy. Add water to the gravy if it is very thick. Add tomato ketchup for taste. This is optional. Cook for 5 min. 4. Once ready, garnish with spring onion flower and serve hot.